The Emerald Pools are a set of 3 pools located in Zion National Park. They are comprised of the Lower Pool, Middle Pool and Upper Pool. 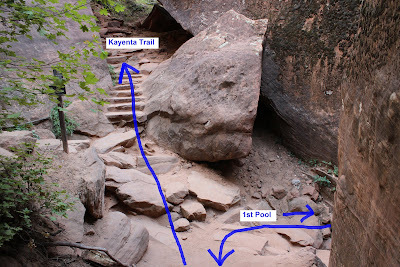 By making use of 2 other trails, the Kayenta Trail and the Grotto Trail, a short loop hike can be made that includes a trip to all 3 pools. The trail to the Lower Emerald Pool probably comes in 2nd to the River Walk in the ranking of the busiest trails in Zion National Park. The Emerald Pools trail begins across the road from Zion Lodge. The road to Zion Lodge is closed to private vehicles during the busy seasons to relieve congestion on the roads and parking areas. Visitors can catch a ride on one of the free shuttles leaving from the Visitor Center and other bus stops. From the bus stop at Zion Lodge follow the signs around the grassy area to the trailhead. The trail crosses a bridge over the Virgin River and follows the trail to the right. The trail is wheelchair accessible, and stroller friendly, up to the First Pool. The route the trail takes follows the contour of the hillside with much of it shaded by trees and brush such as the Gamble Oak. Water at the First Pool comes seeping out of the rock and spilling over the cliff above the trail. With all of the spray of water that there is to walk through be sure and check your camera lens after passing by the First Pool. It might have a good coating of mist that needs cleaned away. The trail between the First and Second Pools has rocks placed for steps in all of the right places making the climb much easier. The tranquil setting around the Second Pool seems to invite hikers to linger around and enjoy the natural beauty of the area. The trail becomes much more primitive between the Second and Third Pools with lots of sand and rocks. The Third Pool sits at the base of a high canyon wall where the white sand of the overlying Navajo Sandstone has built up to make a nice beach. The Navajo Sandstone is thought to have been part of what was at one time the largest sand dune in the history of the planet. The porous sandstone absorbs water which filters through the rock until it finds a layer that it can't penetrate. Eventually the water finds a weak area where it can seep through. Some of the water here comes from seeps and some of it comes from runoff. If you find the area around the Third Pool to be a little anticlimactic after having hiked up the mountain to see it you should feel more than compensated by the spectacular views of the park from that vantage point. 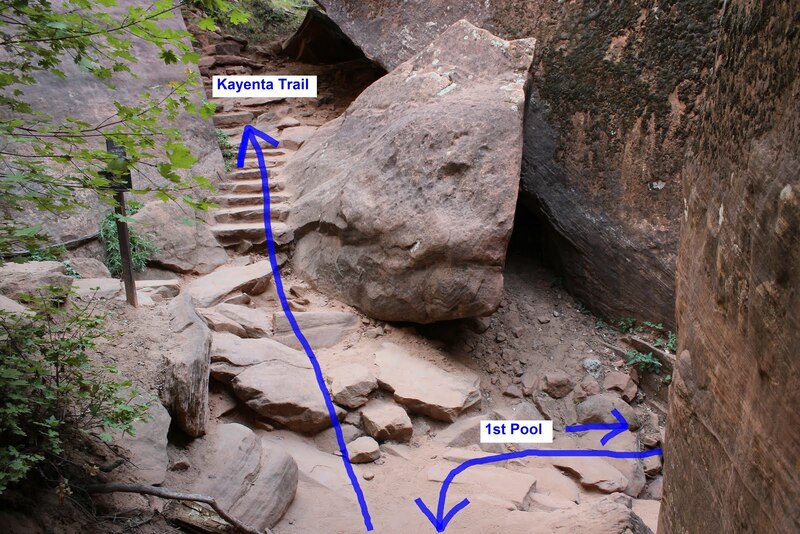 There are 2 places where you can set off onto the Kayenta trail. The first is a fork between the Second and Third Pools and the other is down by the First Pool. After having hiked to the Third Pool a lot of effort can be saved by taking the first fork that you come to. The Kayenta trail traverses around the mountain on a bench above the valley floor. The trail has an easy to hike slope for its entire length with a drop to the river at the far end. There are some incredible views of the valley to be taken in from the Kayenta trail. At the north end of the trail the Kayenta trail comes to an end at the junction with the Angels Landing and West Rim trails. From here the trail crosses the Virgin River and the road once more to the Grotto bus stop and trailhead. There is another restroom and a picnic area at the Grotto as well as a historic building that served as the parks first headquarters. 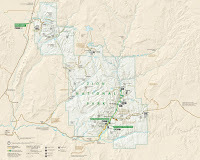 A person could catch the bus back to Zion Lodge or perhaps head up canyon for another adventure. The Grotto trail is sandwiched between the road and the east side of the canyon. The 1 mile long trail is easy to hike and wildlife such as deer and fox can sometimes be spotted along the way. There is no reason to pack a lunch for this hike. At Zion Lodge you can buy a cold beverage with a hamburger or other sandwich and enjoy an ice cream cone for dessert. 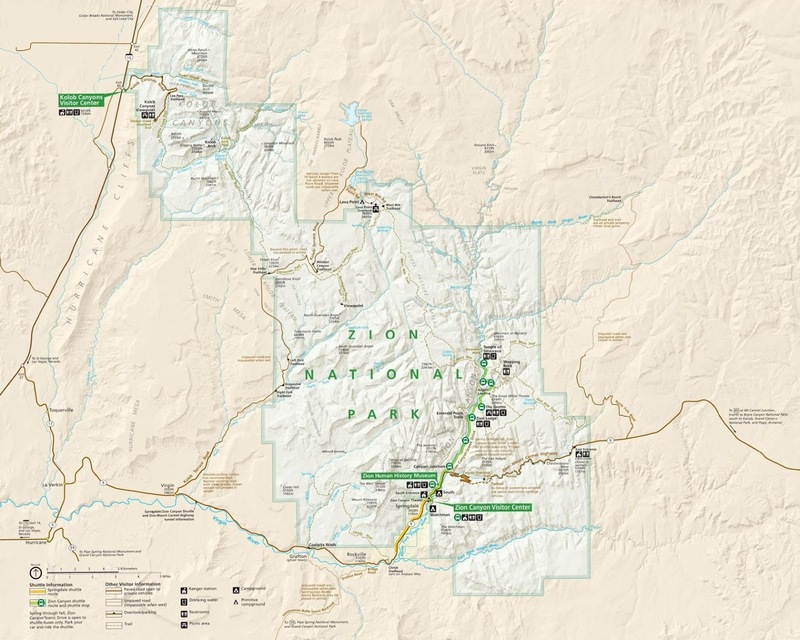 With the Emerald Pools being one of the top attractions at Zion National Park the trail can get very busy. Most of the traffic is only to the First Pool but there is still a good part that make it all the way to the Third Pool. Most visitors return the same way they came so the Kayenta and Grotto trails receive only a small fraction of the traffic. As with other trails the early morning and late evening times are the least busy. The River Walk, which is the most popular trail in the park, is on up the canyon. Often times when the bus comes down the canyon from the River Walk it is standing room only by the time it reaches the lodge. Fortunately another bus comes along about every 8 minutes or so. That's life in the 7th busiest national park. If you would like to see it for yourself then all you have to do is 'Take a hike'.